Admit it, we're pretty demanding of our movie theaters: IMAX screens, seat shaking sound and glorious AC are the bare minimum. Sol Cinema offers a different experience. It's a glorified trailer that fits 8 people and is completely solar powered. "The U.K. isn't famous for sunny days, yet [we] still manage to run our entire cinema, including video projectors, sound systems, laptops, hard drives and lights from the energy of the sun via solar panels. This means we have no utility bill each year and can perform anywhere at anytime." 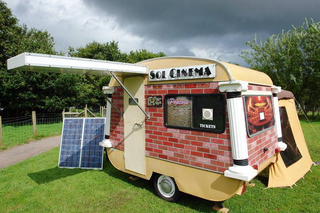 The film projector they use is powered by four large lithium-ion batteries that are charged by two 120W solar panels. Sol Cinema refrains from showing anything that glorifies violence or is "too mainstream". They tell customers to think more "Michael Moore rather than Demi Moore".